Reconditioned Kirby Diamond edition with genuine Kirby tools, GV bags and 5 year motor warranty through GV. Includes the upholstery tool, crack and crevice tool, duster brush, wall tool, floor tool, with two wands. It also includes the pet tool, inflator tool, handheld tool, handheld shampooer, blower, corner wand, hose and tool caddy. 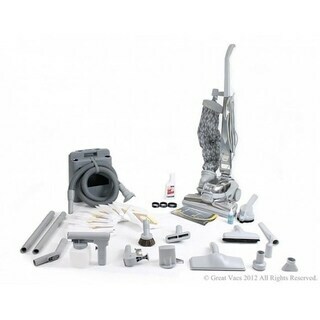 This will also come with the popular Kirby Zip Brush, which is great for cleaning stairs, upholstery, and car seats, 1 12oz bottle of Kirby Spot Remover, 4 new GV belts (one installed) 9 new GV HEPA bags, and 1 bottle of fragrance that you apply to your inner bag which makes your home smell nice and fresh while you vacuum. 5 YEAR WARRANTY - GV reconditioning process includes cleaning and sanitizing every part as wells as thorough check and replacing any worn parts to ensure the Kirby is in perfect working order. Warranty covers fan, motors, bearings and transmission. The most versatile vacuum made. It can go from upright to canister to hand portable to blower to straight suction upright. It is the best vacuum to vacuum your mattress with as well. HEPA filtration. One of the best vacuums for allergies. Most HEPA filters only filter to .3 microns but Kirby Filtration can filter as small as .1 microns (3 times better). The Kirby vacuum is the best deep cleaner we have seen which also will improve allergies.